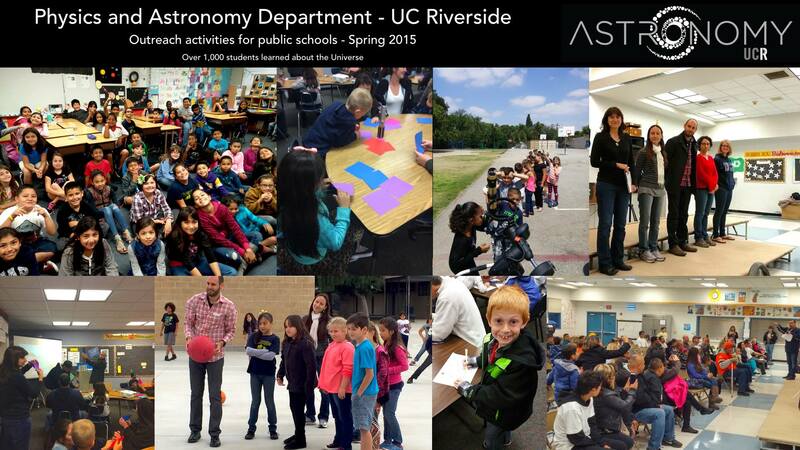 The Department of Physics and Astronomy at UCR announces its call for K-12 public schools to request an astronomy workshop for Winter 2018 (February through March). Workshops have been implemented for over three years under the supervision of Dr. Mario De Leo-Winkler, an astrophysicist whose expertise lies in public outreach and informal education, and over 10,000 students have enjoyed the wonders of the Universe, through talks, hands-on activities and telescope viewings. The activities are offered free of charge and are given by postdoctoral scholars, graduate students, high-school volunteers and faculty members of UC Riverside. Workshops are designed following the New Generation Science Standards. UC Riverside covers the cost of materials thanks to National Science Foundation grants awarded to Prof. Gillian Wilson, Prof. George Becker, and by the FIELDS Program lead by Prof. Bahram Mobasher. Workshops are offered to the Riverside, San Bernardino, Valverde, Perris and adjacent school districts, and are available in English and Spanish. Read about our 12 available astronomy workshops. Please take special care to review details and requirements.